Former president Maria Corazon Cojuangco Aquino popularly known as "Tita Cory" passed away today at 3:18 AM due to a cardiac arrest, which was a complication of her colon cancer, which she bravely battled for months. Democracy in our country will not be possible without her courageous leadership during the martial law and post martial law. Thank you Tita Cory, for being a great leader and an inspiration to all. 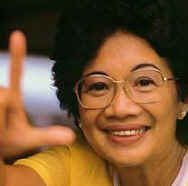 She is now together again with the only man she loved, Benigno "Ninoy" Aquino. Two people who once displayed tremendous leadership and bravery that forever changed the Filipino people, now united in heaven.